The Center for Critical Environmental and Global Literacy (CCEGL) offers a series of educational teacher Institutes and workshops. Institutes vary in length, cost and availability of support funds. (one day, one weekend, four Saturdays, four evenings or ongoing five month process) Below is a brief description of available offerings and mini-workshops. Institutes and workshops are appropriate for individual teachers, a team of teachers from one school or an entire school staff. Note: The board of directors of the center for critical environmental and global literacy will consider and support Proposals for Institutes and, workshops that are aligned with the center’s mission. Please contact us with your offerings. The following is a brief description of Educational Institutes and Workshops offered by the Center. The goal of this institute is to help teachers to gain a global focus for their teaching and to help their students to understand common environmental and social challenges among the world’s peoples. For the past 15 years, this project has been carried out with San Francisco Bay Area classroom teachers as they learned about both the local and global implications of current environmental challenges. During international collaborations teaching practices and common life themes are explored and lasting personal and professional relationships are developed. Students in the home classroom become thoroughly integrated into the journey of their teacher and the process and experiences are also shared with families and the school community. The Institute spans a three month period and includes a twelve day visit to a “developing” country. Participants will learn about the history of family involvement in education and will create a program for their school or community, guided by a successful model that has been carried out by organization members for the past 18 years. It is a well developed program model that is interactive and critical in nature. Sessions will be created that focus on the themes of food and nutrition, diversity and culture, urban sustainability and media literacy. Participants will be guided by center staff to implement a program and begin the work. CCEGL educators prefer to work with a team of teachers from one school or an entire school staff. This one day institute will use the sharing of artifacts from culture and childhood to create a strong and respectful classroom community. The emphasis will be on understanding and embracing differences within a group and using these understandings as a tool to contextualize literacy development. Participatory Research is an interactive process based on a philosophical and ideological commitment which holds that every human being has the capacity of knowing, of analyzing and reflecting about reality so that she/he becomes a true agent of action in her/his own life. It is a form of popular education and social activism. A major goal of Participatory Research is to bring about a more just society. 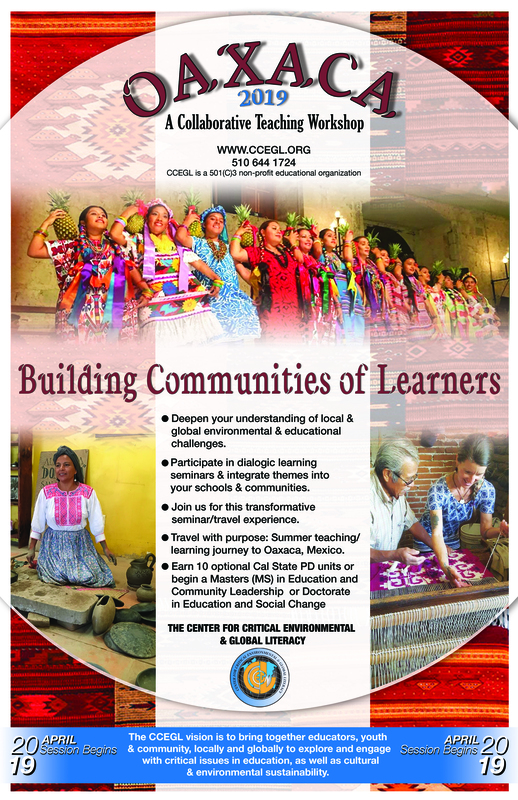 Through the process, participants become co- participants in a dialogue in which new knowledge emerges and can subsequently be transformed into action. Education becomes the generation of new knowledge through dialogue. This institute, will utilize both a group and individual classroom-based projects that will guide teachers to understand Participatory Research and be able to use it as a research tool in their own classrooms. “Teacher Research” is directed towards changes in practice. Through such methods as observation, participation, reflection and documentation, teachers can improve teaching in their own classrooms and can make change in families, schools and community. The process includes journal entries and data collection. The final phase is an action project that in some way changes teaching practice to be more effective. 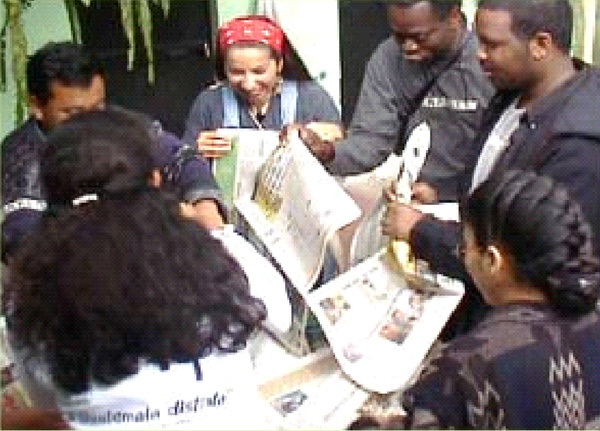 Past projects have included: the creation of a school garden, exploration for a pedagogy of hope using children’s literature, investigation of the cycle of production of the clothes students wear and the connection to child labor and an analysis of the influence of TV on the consumer habits of youth. 7. Youth Voice and Youth Guided Action: (4 hours)In this workshop participants will explore culture, language and diversity within their groups and try out new ways to build bridges across differences. Participants will have an opportunity to reflect on race, class, gender and ability. A compassionate approach to embracing differences and working better together is emphasized. This workshop is ideal for whole school or community groups wishing to find ways to work together more effectively and more collaboratively. Recognize the youth you work with as change-makers. Young people “read their world” on a regular basis, and that experience can translate into powerful learning opportunities through action projects. Integrate youth voice into long-term projects, as well as daily classroom systems. We will also explore internet forums as a way to connect youth globally. Participants will explore the history of the environmental justice movement as it relates to environmental education today. 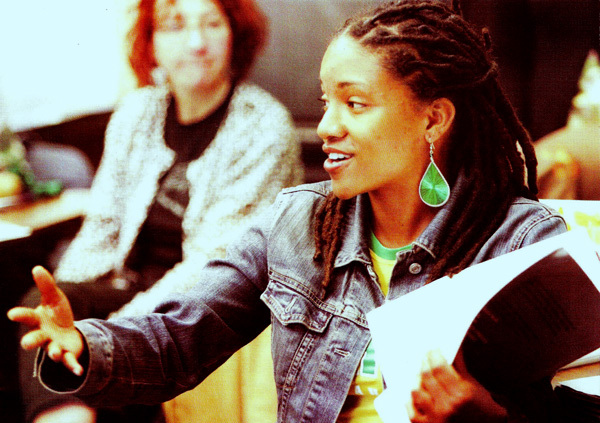 How can educators inspire environmental action through critical curriculum that looks at disproportionate impacts of environmental hazards on low-income communities and communities of color? In this workshop we will investigate Bay Area environmental hazards and the parallels between Bay Area environmental justice issues and issues in the Unites States and the rest of the world. Learn hands-on methods to teach children and youth how to take a critical look at their own environment and develop possibilities for action. By tracing a meal back to its many sources, we can learn a great deal about environmental issues, labor around the world, transportation, as well as nutrition. How pollution affects traditional food sources and how international food aid realloy impacts global hunger are two of the topics discussed during this workshop. Teachers of all grades will create lessons that not onlybuild on student’s hea;lthy habits, but also deepen their understanding of food issues around the world. Discover the science and history of plastics from cradle to grave. Learn resources and activities for teaching plastics consciousness to your students. How does our use of plastics in the United States impact production and use globally? Develop a school-wide or grade-level action project for reducing plastics consumption. Does plastic ever go away. Water is celebrated as it sustains life for humans and other living beings. However, there are threats tot the health of our watersheds, as well as the accessibility to people in communities around the world. There are numerous examples of communities that have succeeded in protecting their sources of water from pollution and unsustainable use. By understanding these issues on a local and global scale, educators will be better equipped to present water to our students in a way that goes beyond the basics of the water cycle and lead to action. This one day workshop will be facilitated by a team of African American educators. They will share their experiences of working with youth and families in their communities. They will reflect on academic and behavioral expectations, the teaching of the Principles of MAAT and perspectives on what is called the “achievement” or opportunity gap. They will share ideas about how teachers who are not from the culture/community of their African American students can best learn about and become more conscious of cultural and community core beliefs, and experiences. The day will include small group dialogue and problem-posing.